Cowboys and Aliens opened this weekend to somewhat disappointing box office, at least as far as I'm concerned - I personally thought it was great. Strong character work and acting, great dialog and lots of fun. Jon Favreau keeps pulling it off, and if anyone could have made a stronger film given the basic premise promised by the title, I don't know who. Let's face it, it could have been the summer's biggest joke. Instead, the material was taken seriously and treated lovingly, and we got a fine film I'm proud to have contributed to. So congratulations to Jon, writers Alex Kurtzman & Bob Orci and Production Designer Scott Chambliss for a great movie! 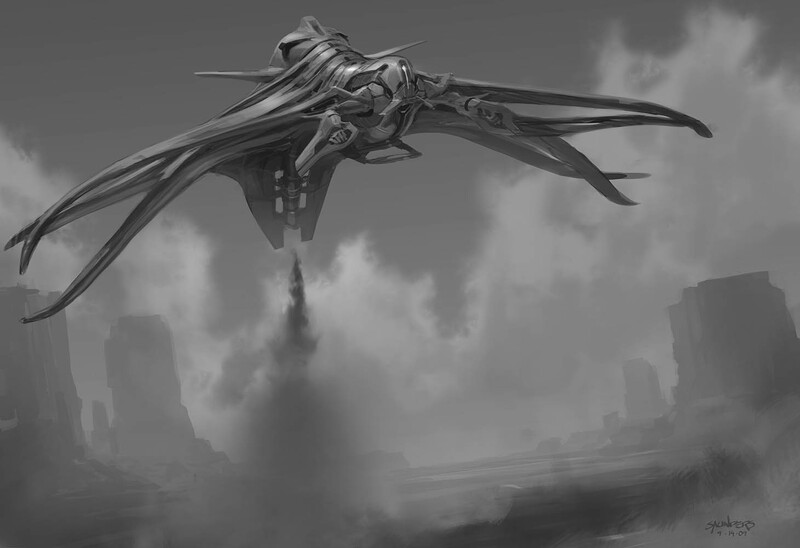 Anyway, I'll be posting some of my concept work for the alien "speeder" vehicle in the coming days. For now, here's the image that I was told caught Spielberg's eye and led to the speeder design as we see it in the film. Very beautiful work. I like your style!!! Was just looking at this concept with some co-workers - we all liked a lot, can see why it caught Spielberg's eye!